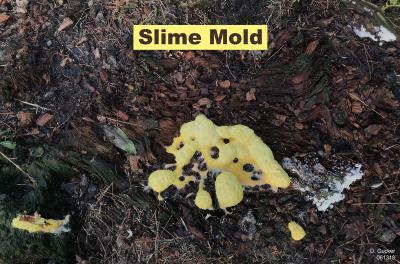 If you have recently seen a bright yellow or yellow-orange slimy blob after our recent stretch of rainy days, then you may have seen a slime mold. It is not unusual to see them in the summer after a period of heavy rainfall or in areas that are heavily irrigated. They commonly appear on wood-mulched beds, or heavily thatched lawns. Slime molds were originally classified as fungi, but now classified as protozoans in the Kingdom Protista, division Myxomycota. The reasons for this are slime molds move very slowly (up to 1 mm per hour), fungus do not move; and slime molds do not have a rigid cell wall as fungi do with their chitin cell walls. To give you an idea of how shocking they look one of our most common slime molds is nicknamed the "dog vomit fungus". This is due to its slimy, bright yellow to orange color and globular appearance. This is the particular slime mold that I have been seeing lately, whose scientific name is Fuligo septica. A slime mold has a single, huge cell called a plasmodium, a blob of protoplasm without cell walls and only a cell membrane to keep everything in it. This resembles a large amoeba and it feeds much the same way, by engulfing its food. Slime molds ingest their food (mostly bacteria), and then digest it. This is another major difference between slime molds and fungi. As they begin to dry out, the colors fade to brown and tan. Turning into a dried blob, it will have a dark brown to black core, which are the spores. The spores are then released by rainfall or disturbance to spread to other suitable sites to begin the life cycle all over. Although many people are alarmed, grossed out, or frightened by it, this slime mold is harmless to plants, pets, and humans (although the dusty spores can irritate people with allergies, asthma, or other respiratory conditions). Slime molds are only a cosmetic problem and disappear on their own in a few days.